All our transmitters have a built-in RDS programmable from the front keys of the exciter or via RS232 connecting to a computer.Since it gives massive importance to low energy consumption, it has GPIO switch that runs air-conditioner when the room temperature or humidity reaches the limit value. ONAIR FM transmitters main features are less heating, less energy consumption, less complicated, and they have a very reliable design. We presented Digital Microwave Link Solutions, which complete the quality audio chain from studio to transmitter. The DVL series digital microwave links are designed to operate on all international frequency bands with digital audio and video quality and present a complete solution to all your TV and FM requirements. 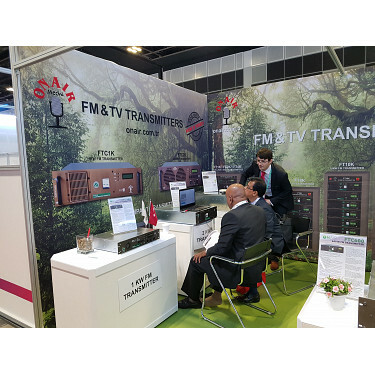 We also featured our key products 25W to 20KW FM LDMOS DIGITAL TRANSMITTERS and designed using the extremely rugged LDMOS power transistors for the FM broadcast market. They are very rugged against reflection, very efficient and with an extraordinary performance. Manufactured with special self managing system feature with excellent improvement of the product performance. ONAIR MEDYA has been proud to be in the business for 21 years. We always wanted to be the first using the new technologies and used the best materials in manufacturing our equipment. With the 21 years experience in RF design and broadcasting technologies, we believe that it helped to improve the broadcasting sector. We design, manufacture and sell Radio and TV Transmitters using the latest technology in the world. We use the latest technology, but we still manage to keep our transmitters’ price even lower than the older types. WE WOULD LIKE TO THANK ALL THE BROADCAST INDONESIA 2017 ATTENDEES! You can visit www.onair.com.tr for more updates and new products and events. Another successful June for Onair, at the 2018 Broadcast Asia, which was held from 26th to 28th June 2018. This was the first show that we presented our new logo.We used our old logo for 22 years. This year not only are our products becoming better but our corporate identity too. ONAIR MEDYA had a remarkable time at the Broadcast Indonesia Exhibition this year which was held at Jakarta International Expo from 25th to 27 of October 2017. Broadcast Indonesia Exhibition was very important for us as we were able to understand the needs and requests of the Indonesian market. We believe that this exhibition will help us to improve the strength and value of our products. We aim to increase our coverage in Indonesia since our transmitters are very popular because of its adaptability to different climate changes. This year we had a live demo to understand how ONAIR MEDYA Transmitters can be controlled via the internet. We were able to advertise our updated product features, improvement of products' performance and the updated self managing system feature in FM&TV Transmitters to our visitors. ONAIR MEDYA has experienced considerable success over the past year at the IBC Exhibition..It was an honor again for us to welcome everyone at our stand during the IBC 2017 Exhibition which was held on 15th-19th September in RAI Amsterdam. It is a great achievement and we are glad that the number of visitors exceeded all our expectations. This year’s show is an outstanding one as we had an opportunity to do a live demo to understand how ONAIR MEDYA Transmitters can be controlled via the internet. We were able to advertise our latest products and the updated self managing system feature in FM&TV Transmitters that we offer during the show.. It is another success for ONAIR MEDYA at the BroadcastAsia2017 Exhibition which was held in Singapore this year. We are very pleased by the attendees that visited our stand to discover the latest products we offer to the broadcasting market as well as to discuss their requirements.It is a sensational event that we particated as we showcased our products from 25W to 20KW FM transmitters designed using extremely rugged LDMOS power transistors at the exhibition. Visitors had a chance to learn the benefits and advantages they can get by using our FM/TV Transmitters with our context of BUY NEW TECHNOLOGY, PAY LESS campaign. It is a phenomenal time for ONAIR MEDYA the leading manufacturer of FM & TV broadcasting transmitters in Istanbul-TURKEY to participate for the 9th time in this year's CABSAT 2017 Broadcasting Exhibition. The Middle East and Africa's largest broadcast digital media and satellite expo was held in Dubai World Trade Centre from 21st to 23rd March 2017. Since we are very active in MENA region Cabsat was a very important exhibition to understand the requests from the Middle East and African regions. We have been participating in this event since 2008 and every year we meet different customers. In comparison to last year's exhibition we were very satisfied with the greater response we received from the visitors for their great interest in our products which helped us to improve the strength and value of our products better. We are proud to announce our outstanding success in the BroadcastAsia Exhibitation which was held at the Marina Bay Sands in Singapore from 31st May to 3rd June 2016. As we participated in Asia’s leading exhibition & most comprehensive tradeshow for the broadcasting industry, we had an excellent platform and opportunity to showcase our products and meeting our customers and partners. ONAIR MEDYA participated in the DUBAI CABSAT Exhibition which was held on 8th to 10th March. CABSAT 2016 gave us the chance to enlighten customers about the advantages of using Onair products. Our main focus was on the FA4K ONAIR 4KW FM Amplifier. Visitors were impressed by the performances displayed by FA4K: Higher efficiciency with lower power consumption and less heating. Last but not least, FA4K remains very competitive in terms of efficiency. We presented our FM transmitters and Digital Radio/TV microwave links at the IBC 2015 exhibition in Amsterdam. There was great interest in our products as usual. Valued around the world, our transmitters are designed with reflections resistant transistors, have a low heating and high efficiency system.Exciter with RDS included and DDS which is the best technology of transmitter modulators made all our customers pulled their hat . Our distributor in Nigeria, Osaze Iyamu has pulled the hat for real.